Our 2019 season runs June 4 through October 29. * Once you sign up for your share, remember to claim your member work shift(s), too! Full share members pick up every week, and commit to 2 work shifts over the 22-week season. Half share members pick up every other week (odd or even weeks are assigned), and commit to 1 work shift over the 22-week season. We offer four pricing plans, based on self-reported household income. Each plan includes a $7 administrative fee that goes toward our membership in Just Food, a non-profit dedicated to food justice initiatives, as well as supplies and events. The rest of your payment goes directly to the farmers who grow your food! Pricing tiers are structured so that neighbors subsidize each others’ shares; Plans C and D (for those at lower income levels than Plans A or B) are priced below actual net cost, making healthy and sustainably grown food more accessible to the wider community. Plan A: $592 full share / $299 half share. (Works out to about $26 / week.) For household incomes greater than $83,000 per year. Plan B: $523 full share / $265 half share. (Works out to about $23 / week) For household incomes of $42,000–$83,000 per year. Plan C: $315 full share / $161 half share. (Works out to about $14 / week.) For household incomes less than $42,000 per year. Plan D: $167 full share / $87 half share. (Works out to about $7 / week.) For households using SNAP benefits to pay for their share. Below are snapshots of two weekly shares—the left image from early summer (as our first tomatoes begin to arrive but before we have a glut of them!) and the right from early fall (when we start to see more root veggies, squashes, and apples). Note that the left image includes optional flower and egg shares; the right includes eggs and fruit. To add fruit, flower, or egg shares, you must purchase at least a half vegetable share. These “extra” shares must be picked up every week, even if you are a half-share (every-other-week) member. Fruit and flower shares have a shorter season. A fruit share consists of organic berries and melons from Windflower Farms, plus other minimally treated (non-organic) fruits from partnering growers. This typically includes late-spring strawberries, cherries, blueberries, and raspberries; mid-summer peaches, plums, nectarines, and apricots; and autumn apples, pears, and cider. Organic bouquets and bunches, packed in travel-ready floral sleeves. Past offerings have included sunflowers, campanula, lilies, lisianthus, daisies, asters, mums, cockscombs (“brain flowers” as one young CSA member calls them), and more. Brown eggs from free-range chickens at Davis Family Farm that strut around pecking in green grass. You’ll notice the difference in the taste of the eggs. PPkCSA members can also order à la carte from Lewis Waite Farms in Greenwich, NY. 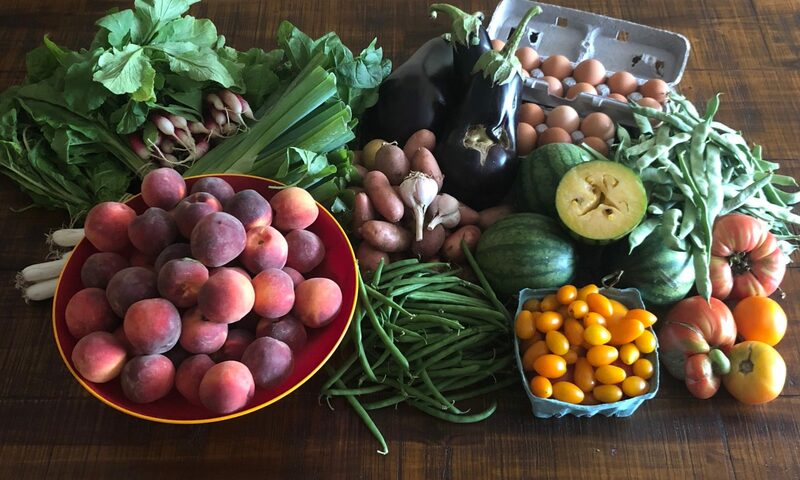 Lewis Waite offers a variety of products sourced from New England farms—meat, cheese, grains, legumes, granola, chutney, tea, mushrooms, spices, and more—delivered right to our CSA distribution site twice a month to pick up alongside your CSA share! You can check out Lewis Waite’s offerings here and create a separate account through their site; they’ll email you directly with info and order deadlines.